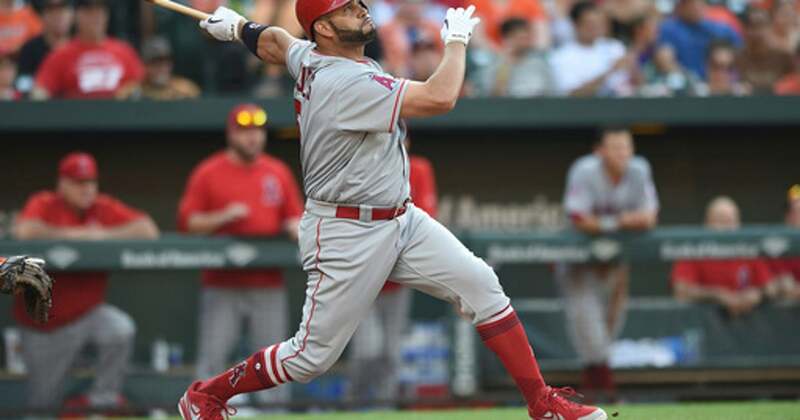 BALTIMORE (AP) Albert Pujols‘ RBI double highlighted a five-run eighth inning and the Los Angeles Angels beat the Orioles 6-2 Saturday, extending Baltimore’s latest losing streak to seven games. Playing their 3,000th game under manager Mike Scioscia, the Angels trailed 2-1 before using three hits, three walks and a hit batter to take control against the free-falling Orioles. After Mychal Givens (0-6) issued a pair of one-out walks, Pujols tied it with his 632nd career double, tying David Ortiz for 10th place on the all-time list. An intentional walk followed, and the go-ahead run scored when Chris Young hit into a force play at third base. Tanner Scott hit Martin Maldonado with a pitch to force in a run, and David Fletcher capped the uprising with a two-run single. It’s been that kind of season for the Orioles, who own the worst record in the majors. Baltimore has five losing streaks of at least six games, is 0-15 against the AL West and has lost 17 of 18 at home. Los Angeles starter Tyler Skaggs allowed two runs, one earned, and four hits over five innings. Baltimore’s Andrew Cashner threw 105 pitches in sweltering temperatures hovering around 95. He gave up one run in six innings but now has gone six straight starts without a victory. Skaggs began his 16th start by giving up three straight singles, and Danny Valencia followed with a sacrifice fly. An RBI single by Andrelton Simmons got the Angels to 2-1 in the fourth. The Angels recalled 3B Kaleb Cowart from Triple-A Salt Lake and optioned OF Michael Hermosillo to the minor league club. Angels: RHP/DH Shohei Ohtani, who has a Grade 2 sprain of the ulnar collateral ligament of his right elbow, batted in a simulated game Saturday. The team hopes he can avoid Tommy John surgery. . LHP John Lamb has a torn ulnar collateral ligament and will undergo surgery in Los Angeles. . RHP Jake Jewell will be out at least six months after undergoing right ankle surgery Friday. . RHP Garrett Richards (hamstring) allowed five runs over 3 1/3 innings in a rehab start Friday with High-A Inland Empire. ”He lost some of his command as the outing went on, but physically he felt great,” Scioscia said. Orioles: RHP Darren O’Day opted for surgery to repair a left hamstring strain, ending his season. … RHP Chris Tillman (back) was scheduled to make his third rehab start, this time with Triple-A Norfolk, on Saturday.